This is how it all started… cockroach, beetle, dragon, or roast chicken? 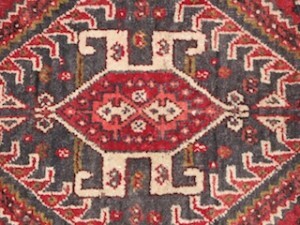 The boteh is a symbol that has been used to decorate textiles in Persia at least since the Sassanid Dynasty (200–650 AD). The word itself may have meant bush, shrub, or simply a cluster of leaves. 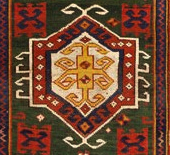 As a motif it has many interpretations. In some cases it is described as a seed symbolising life and renewal, often enclosing a mature plant within it, as if to suggest that the whole always exists within the part. Many believe it is the convergence of a stylised floral spray and a cypress tree, which is a Zoroastrian symbol of life and eternity, much like the tree of life elsewhere. Because of this association with Zoroastrian tradition, the boteh is sometimes referred to as the flame of Zoroaster—the eternal flame that burns continuously in Zoroastrian temples. 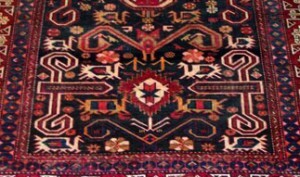 The boteh is also the precursor of a much-loved Western pattern—paisley. Protective motifs galore. Which one is a scorpion? This entry was posted in Craft Heritage and tagged anatolia, bereket, boteh, carpets, dragon, elibelinde, gul, kilims, motifs, qashqai, ram's horn, scarab, tree of life. Bookmark the permalink. Both comments and trackbacks are currently closed. very well written…I learned something new. which seem to very quite rare now a days. Thank you for reading our blog, Tess. I am not familiar with the pottery motif that you mention… I guess it is indeed rare! 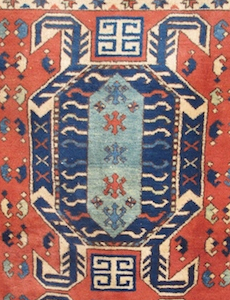 I have seen examples of stylised vases in Persian rugs, and stylised ewers in tribal rugs from the Caucasus and elsewhere, but I cannot say that these are examples of a recurring and readily identifiable motif. If you can send me a picture of what you mean, though, I will investigate.